Mark the locations for the track on one of the blocks of 2x3 lumber. On the broad side of the block, make 3 lines across the width of the block, at 1-1/2, 2-1/2, and 3-1/2 inches from one end. These are parallel to one end of the block. 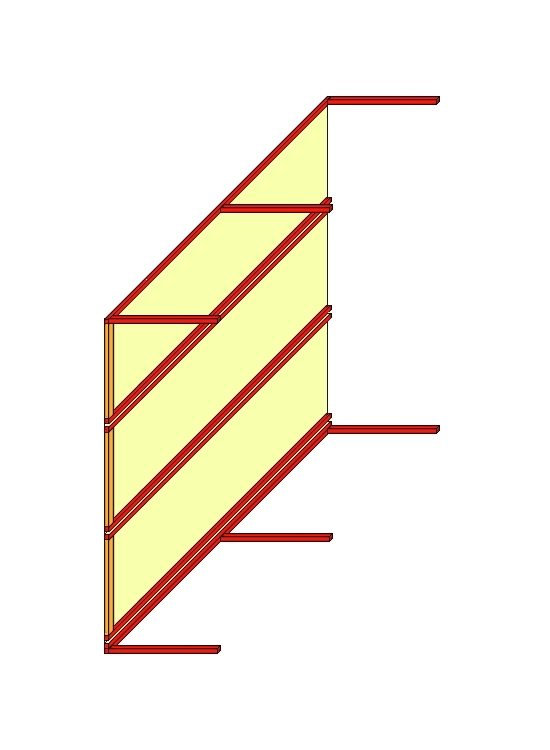 The lines outline the locations for the Unitrack sections. On the same broad side of the block, mark the centerline parallel to the long dimension of the block. Mark locations near each end for one of the washers. Mark the center point of each washer. Be careful to avoid the locations for the track, yet don't fall off the end of the 2x3! Clamp both blocks together on your workbench. Be sure to back up the 2x3s with scrap lumber; you're going to be drilling! Make sure the edges of the blocks are aligned. At the marked centers of the washers, drill with the 1/8" bit through both blocks. These holes are to center the remaining drill work. On the BOTTOM side of both blocks, drill with the 1-1/2" bit deep enough to countersink the bolt head or half of one of the nuts. This is about 1/4". Re-clamp both 2x3s, carefully lining up the holes. Drill with the 1/2" bit through both blocks. The 1/2" hole must be drilled after the countersink is drilled or you'll have nothing for the 1-1/2" drill bit to center on! Insert the bolts (without washers) into the countersunk side of the bottom block. Slide on the 2nd block WITHOUT ANYTHING BETWEEN THE TWO! Slide on a washer, then one of the regular nuts. Clamp the 2 blocks together, being careful to align the edges of both blocks. Tighten both nuts. Use the wrench, and tighten until the heads of the carriage bolts seat firmly into the wood and are countersunk below the level of the surrounding wood. It's important to do this while both blocks are together to make sure both blocks of wood will slide on the bolts. Release the clamp, and loosen and remove the nuts. The bolts should stay put; don't move them! Remove the top 2x3. Place the bottom 2x3 on the table, with the bolts pointing up. On each bolt, drop on a washer, spin on 2 nuts, and add a 2nd washer. Slide the 2nd block over the bolts, being sure to keep the track side up. Drop on the final washers, then spin on the wing nuts. Lay the gage sideways on the table. This keeps the two blocks parallel. Tighten just the bottom nuts to anchor the bolt to the bottom block. This is a permanent tightening; be firm! Keep the edges of both blocks flat on the table as you tighten to make sure the blocks stay aligned. Adjust the nuts under the top block so the top of the top block is precisely 4" from the bottom of the bottom block. Tighten the wing nuts firmly finger tight to keep this adjustment from moving. Smear contact cement where the 2 pieces of track should go. While the cement is still wet, align the track with the lines you made earlier. Center them so they hang over the edges evenly. Now wait 24 hours for the cement to dry. Or, if you're in a hurry... After my gage fell sideways once too often and knocked the track loose, I used SuperGlue. Worked fine! When completed, the gage will sit patiently on the tabletop with track side up. The basic building block is 2x3" lumber. The 3" nominal dimension is actually 2-1/2" or so, about 64mm. The rail joiners don't actually lock onto the sections being checked; they're a tad too short. However, this is not a problem, since the gage isn't intended to be permanently attached to the layout. The countersink under the top block is necessary to provide enough room to adjust the spacing the required +/- 1/4". Don't countersink the top of the bottom block unless you have a LONG socket and socket wrench! You need something for the wrench to grab onto! Tighten the wing nuts enough to stay put, but loose enough that you don't need a wrench to undo them. After everyone agrees on the 'correct' height for the track, adjust the gage to that height. Slide the gage up to the end of a module. If the rail joiners don't line up, the gage wins. Adjust the module until it matches the gage. You can adjust front to back by aligning the edge of the module to the top of the gage. Since both ends of the gage are measured as the wing nuts are tightened, a level table is not required; the gage compensates. If there is a large adjustment, you may have to adjust both ends of the module at least twice-- Depending on the distance of the module's adjustment bolts from the end of the module, the adjustment of one end will look OK, until the 2nd end is brought into alignment. Then the first end will be off just a hair. As I began accumulating a medium-sized pickup truck full of T-Trak Paraphernalia, including an ever-growing collection of large plastic tubs in which to haul T-Trak modules, it quickly became apparent that I needed a transportation container that would protect the modules from damage, be easy to load, and minimize the number of containers to haul. 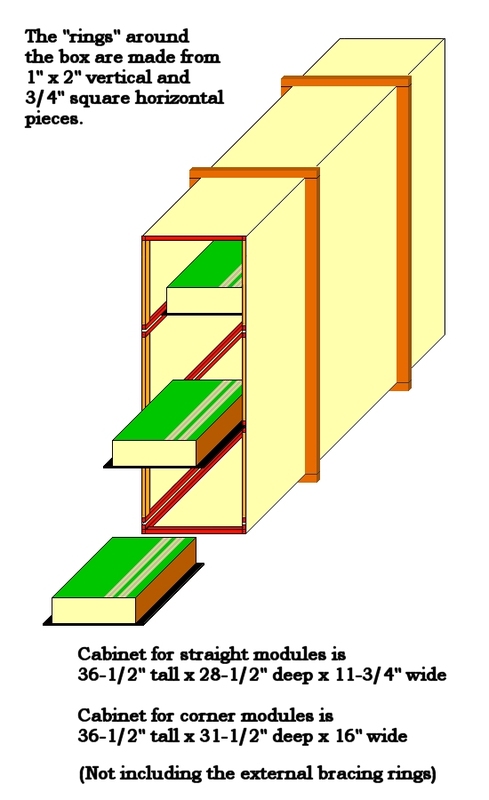 My sketches resulted in the slide-in container shown in Diagram #1. The containers allow the modules to slide drawer-like into a sturdy yet lightweight package. To accomplish this feat, I fastened 1/4" hardboard to the bottom of my modules to act as drawer slides. The containers have just-greater-than 1/4" slots that accept the modules. I was careful to position the hardboard on straight modules so that it would not interfere with corner modules, and vice-versa. Unlike Diagram #1, the hardboard doesn't extend the full width of a standard module, but stops about 2" short of each end. Diagram #2 shows the inside of the 2 sides and the back of the container. The framework is relatively lightweight molding Gorilla-glued to a skin of 3/16" plywood. Although I used stapler-driven brads to hold things in alignment during construction, most of the container's strength comes from the Gorilla glue. The framing members along the top and bottom of the side panels (as well as the struts joining the 2 sides together) are 3/4" square. The runners and framing around the door are 1/2" x 3/4" square (with the 3/4" side glued to the side panels). I've built 2 different size containers. The container shown above has 3 slots to hold modules. The width was planned so I could store straight modules up to 9-1/4" front-to-back. That's 1" more than a standard module. The depth will handle 2 standard or 1 double-wide module. My second style only has 2 sets of slots to handle my taller corner modules. The width is also wider, and should just barely handle the new 14-3/8" square wide-track corners. The depth will accept 2 corners (a complete U-turn). The Depth of the containers must be enough to handle the modules it stores, plus an inch or two in front and back for foam padding. I've been using some handy strips of white crumbly-foam. The Width of the containers must be enough to handle the front-to-back dimension of your modules, plus about 1/2" on each side for the 1/4" hardboard runners. Note the doubled 3/4" strips at the bottom, which allows modules with bolts extended to slide in smoothly. Don't forget to allow for the thickness of the plywood when planning your containers! 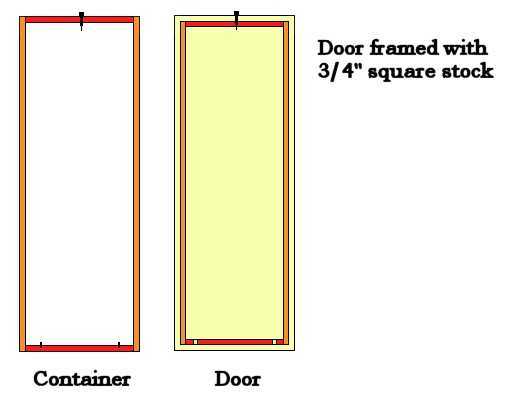 Measure and cut the panels for the sides of your containers. Lay them on your work surface, inside up. Carefully lay out the positions of the molding. The slots for the runners must be slightly wider than the hardboard so your modules will slide in easily! Note the extra strip of molding at the bottom. This allows for the adjustment bolts to slide into the case. I used Gorilla glue to fasten the molding to the plywood. This required about 5 hands: I ran beads of glue under the molding, then flipped the panels over and tacked the plywood to the molding with a brad nailer. No, not like Norm uses; I loaded brads into my staple gun. This was a lot of fun-once flipped over, it took x-ray vision to see the alignment marks. My hands were coated with Gorilla glue for days! If I build more containers I have an alternate construction idea-- Assemble the side panels on a piece of scrap plywood. Dribble the glue in the right places, align the molding, then tack nail from the top, thru the 3/16" plywood into the scrap plywood. Use long nails and don't pound them all the way in. You may also need to place weights on the molding to keep things in place; Gorilla glue expands a little as it cures-it's very much like Great Stuff insulating foam, but engineered for stickiness, not expansion. But you do need to clamp or tack nail things into place while it cures. After the glue dries, remove the nails. The Gorilla Glue is more than strong enough to hold things together without the nails! Of course, I haven't tried this method, but it's got to be less effort than constantly flipping the panels over, hoping the molding stays in place until it can be nailed fast! Once I had a collection of side panels, and the glue was dry, I cleaned up the excess glue with a screwdriver to make sure the slots were open for use as drawers. I then screwed cross braces to the top and bottom of the side panels. This created a framework that could be skinned flush with 3/16" plywood. See Diagram #3. I screwed through the good side of the side panels into the end of the cross braces. A little dab of glue might be used here, but I didn't. After the plywood skin was glued on, I removed the screws. Once you have the sides joined by the cross braces, you can glue on plywood to the top, bottom, and back. I cheated at this point- I made these panels oversized, glued them fast, then used a router to trim things to just the right size. If you are more patient with your woodworking than I am with mine, you can cut things a bit more precisely and do it right! The front panel is a piece of plywood (trimmed to size) with a rectangle of molding inside. The molding on the door is sized so the door is a snug fit just inside the molding on the rest of the container. To shut the door, I half-buried 2 tiny-headed screws in the bottom cross brace of the 'door' (heads extending outside of the brace), and drilled slightly oversized holes in the bottom molding of the container. This keeps the bottom edge of the door in place. My initial design relied solely on the strength of the plywood panels, rather than on heavyweight framing. 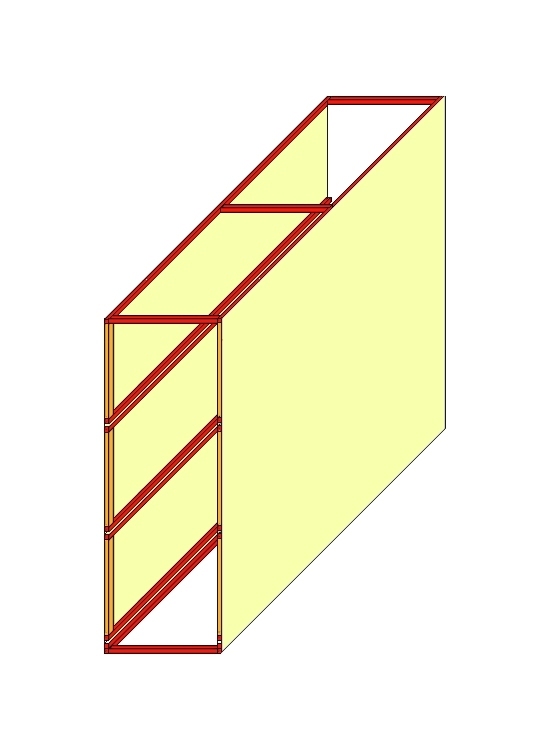 Indeed, the back wall of the containers has no vertical framing, and the front corners only have molding strips so the door will fit smoothly. Because of the lack of framing, I was afraid that the plywood sidewalls would bulge out halfway down the container, and allow the modules to collapse on top of each other. To prevent this calamity, I wrapped each container with 2 constricting bands-- 1"x2" lumber uprights and 3/4" square cross members. The cross members are screwed to the uprights at the corners. See Diagram #1 again. The 1"x2"s are used on edge to provide more leverage and straightening power to the design. Since 1"x2" lumber is usually not the best lumber in the yard, you'll have to pick and choose to get straight, un-knotted pieces. I'm generally happy with the way things worked out. I have 4 containers-- 2 for corners and 2 for straight modules. I have room to ship 8 corners, and 6 double or 12 straight modules. And they all fit in the truck! (: The only problem is that vibration during travel will usually vibrate several of the adjusting bolts loose, and they'll have to be reinserted. They all have hardboard fastened to their bottoms so they slide into the containers almost as fast as the layout comes apart. So I needed a way to keep people at arm's length from the trains. Not being one to (totally) abandon convention, I, too, have constructed a system of barricades. There are 2 schools of thought-- "sneeze guard" Plexiglas shields, and "barrier rope." I chose the "barrier rope" route. The concept is to place a rope barrier 2 foot or so in front of the layout. It doesn't obstruct the view (much), and keeps people back. Of course, the rope needs something to hold it off the ground. *	 --- Since I built these stanchions I decided that they're just too heavy! I installed a carbide-tipped blade in the circular saw and sawed each block in half-- resulting in blocks 8"x8"x4"high. This makes one HECK of a mess! Do it outside, and make sure the wind is blowing away from civilization! The saw only went about 2" deep. This was enough to cut through the block. I used an old handsaw to slice through the foam and plastic pipe in the block cavity. The 8x8x4 blocks are more than stable enough to hold the barricade posts upright. - paint brush, cleaning supplies, etc. Slice the garbage bag open along the seams so you have a large sheet of plastic. Lay it on the floor. Line up the cement blocks on the plastic, holes facing up (and down). Cut the plastic pipe into lengths the height of the blocks. That's 8" for a full-sized block; 4" for an 8" x 8" x 4" block. Drop one piece of pipe into the hole in each block. While holding the pipe upright in the center of the hole, squirt expando-foam into each block cavity until it's no more than 2/3 full. This stuff expands, so if it looks like it's too little, it's probably OK. You may have to add a dollop after it's had a chance to 'grow.' Let the foam cure overnight. While you're waiting, paint the dowels. Screw the teensy screws into one or both ends of the dowels. You can now either use string and hang them from the rafters, or prop each end on the edge of something. Paint them. Hanging or propping them makes it easier to get a smooth coat of paint. I chose yellow for the dowels in the hopes that they'll be more visible. Once the foam has cured (and don't get anxious-- the stuff cures on the outside first; the inside takes longer to dry), use an old saw and saw the foam flush with the top of the blocks. Use a long screwdriver, coathanger, or other long pokey thing and clear any excess foam from the inside of the pipes. Once I had most of the foam cleared, I rammed a dowel down the pipe until it moved freely. Notice how the end of the block that was 'down' has a 'skin' on it, unlike the rough surface where the foam was sliced off. I used the smooth end as the 'up' end for my blocks. Slide a crutch tip or furniture foot onto one end of each dowel. Lug the blocks to the site. [this part alone says a lot for the advantage of some other method of protection]. Place them where they'll do the most good. Insert the dowels. Clamp the plastic ribbon to the first stanchion. Festoon the ribbon from upright to upright, clamping as you go. Using these barriers with T-Trak, where the train is on a standard banquet table, I discovered that the table is just at kid's height. Placing the ribbon at the top of the stanchion made it very easy for a youngster to duck (or just walk) under the 'barrier.' I suggest running 2 strips of barrier so you block the adults and the kids! After the event it's your call if you want to roll up the ribbon, or just toss it. I've been using surveyor's marker tape, which is only about 1" wide, and is a royal pain to rewind. I've been tossing it. "Police Line Do Not Cross" ribbon is wider, and may be easier to roll back up. I've been transporting the dowels in one of those overnight delivery triangular document 'tubes.' They stick out the end, but at least they're together. I'm thinking seriously about 'sneeze guards,' mainly because of the weight of the cement blocks. Even after cutting the cement blocks down to 8" x 8" x 4" I've discovered they're still too heavy! Fortunately, there's a third option: Signs. Dave Halloran has been using signs for years, and, after trying them, I agree that you don't need anything more. After using the signs at several shows, I haven't had any more frisky fingers than when I was lugging the concrete blocks around! When last I saw Dave's signs they said "NO TOUCHING-- Violators will be shot. Survivors will be shot again." And at the 2011 Dayton Train Show some anti-shoplifting signs said, "Shoplifting is a crime. Violators will be killed and eaten!" Medium-well-done, please! automobiles and tractor-trailers, or the teeny little people. don't touch the 'water;' you'll get your greasy fingerprints all over it! There are many reasons to bring a layout to a show: There's finally enough space to set up all of the modules; you can show off your modeling skills; you can push the hobby. Of these, I think we forget about the 3rd reason. I've seen some chatter on The Internet about the 'graying' of the hobby-- how there aren't any youngsters around. But we don't do anything to encourage them. At a recent show I brought along Thomas-the-Tank-Engine (and Annie and Clarabelle). When they were chugging along, I had kids (and at least one mother) so excited I was afraid they'd have an accident! Now you can argue that Thomas is not prototypical, and 'things like that don't belong on a railroad,' but you can't deny that he's a crowd pleaser-- and that's the whole idea. Make it FUN! You can count rivets once you get back home. And maybe, just maybe, some of those kids will be excited enough to actually join the hobby. At the end of the same show, someone mentioned that he was surprised we didn't have a signup sheet. Doh! We pushed the handouts, but how much better would it be to send a newsletter, or invitiation to join, or something a few months before the next show. Many people just want that little -push- to get involved. I know it works-- I had the business card from one individual, and emailed him before a show. And he built and brought 6' of T-Trak modules! I have a T-Trak layout. It's designed to be placed on a standard banquet table. This puts a T-Trak layout right at a kid's eye-- and hand-- level. Kids love trains. They love to touch them. Most layouts require a cop to keep hands off of the trains. Most of the kids are well behaved, and the parents are in good control. Sometimes it's the 'big kids' (the ones in the 20 and up age group) who are more trouble than the little ones! I think it's better to divert the hands to something they -are- allowed to touch. For my T-Trak layout I built 2 pedestals with pushbuttons on top. One blows a 'steam whistle,' the other a 'diesel horn.' Some people say the diesel sounds more like an Edsel, but... I digress. The pedestals are placed outside the crowd control boundary, one at either end of the layout. Kids react a lot better if you tell them "you can't touch the trains, but you can go over there and push that button." I've had kids grinning and running back and forth between the buttons once they figure out what they do. And I've had families stop back because a kid wanted to push the buttons one more time before they leave. I sometimes have to put 'please push' signs next to the buttons, because parents keep stopping the little fingers before they can push the buttons! Now adults ask, "What does it do?" I tell them to try it and find out. I really need to add a sign that says, "Kids First!" Too many times mom or dad will push the button, then ask the kid if they want to push it too! That means mom or dad gets the 'surprise,' not the kid. Another enhancement will be to move the throttle to my pedestals, and let the crowd control the speed of the trains (with the Ultimate High Speed Limit set by me). Have some simple tasks for the 'engineer' to accomplish-- spot the steam engine under the water tower, stop the passenger train at the station, etc. My next thought is that people want to touch stuff to find out what it's made of, how much it weighs, and what the texture's like. So I think yet another campaign may be to encourage all layouts to include a Please Touch section-- perhaps a module-under-construction where you could tolerate a little rework. But let the people feel a sample of the foamboard; pick up and heft the end to get an idea of the weight. Maybe have a plank that goes from naked board at one end to fully landscaped at the other. All available for touching. How -does- that grass feel? Is that pile of 'loose rock' really all glued together? And more pushbuttons. Add some automation, with buttons that people can feel free to push! "So they loaded up the truck and they moved to Beverly..."
If you've ever been to Summer Camp you know the first rule-- PUT YOUR NAME ON EVERYTHING! Goes double for a train show when one re-railer ramp looks just like the next! Put a paint stripe in 'your color' on things. Use a paint pen and write your name or initials on the bottom of every engine and piece of rolling stock you plan to bring! Put your name on your modules. This can be up-front and gorgeous-- you -want- everyone to know you built it, don't you?? The remainder of this list gets into a lot of minutia; things that you might need if you're organizing a major show. You won't (or shouldn't) need a lot of these things all the time! Laptop computer for JMRI - AND POWER SUPPLY! cables for printers, JMRI, etc. Soldering iron, solder, soldering iron holder, etc. Assorted Track to fill in places where they're needed! --some tiny, some larger; bring some bridges! -- if cordless, bring the charger! Screwdrivers = flat, Phillips, square drive, etc. -- 1-1/4" blocks, lifts table from 2-3/4" to 4"
Use your cleaning station and clean the wheels of every piece of rolling stock and every engine you plan to take with you. You say you don't have a cleaning station? -- Paper towel holder. If you get one that folds flat, your cleaning station will be more portable. -- Piece of track, in your favorite scale, at least as long as a roll of paper towels is wide. -- Power feed connector (Optional but recommended). Attach to one end of the track. -- A board, big enough to mount the towel holder, the curtain rods, and the track. Mount the parts as shown in the diagram. The towel holder mounts toward the back of the board. The track is centered about 4-5 inches in front of the towel holder. The curtain rods on either side of the track, about 1" from the track. Mount a roll of towels in the holder, loose end at the bottom pointing toward the track. Thread the towel under the first curtain rod, over the track, and under the second curtain rod. Dampen the towel heavily with your favorite wheel-cleaning fluid. I use 90+% rubbing alcohol. Re-rail a car on the track (on top of the towels) and roll it back and forth. The damp towel will moisten and rub the dirt off of the wheels. When the area of the towel becomes soiled (I had to use that word), simply pull the towels toward you so a clean spot is over the rails. You only have to pull 1/2 a track worth; position the clean spot that was between the rails over the front rail. Add more cleaning fluid, and continue! To clean engine wheels, add power to the track, position the engine on the towel-covered track with a couple of wheels on the bare track. Turn up the power, and let the motor spin the wheels on the towel. If you use alcohol as your cleaning fluid, MAKE SURE your fingers are dry when you re-rail a car on the track! Some lettering and paints will dissolve or smear with alcohol as a solvent! Ask me how I know this. Use your favorite method and make it shine! Think about buying a whole bunch of UniJoiners and replacing every UniJoiner at both ends of every module! And after you use the Joiner Wrench and remove the old joiner, use a tiny wire brush and brush the exposed ends of every rail- make the contact area shiny! And (although I haven't tried this) I think that dunking the old UniJoiners in an ultrasonic cleaner may do them a world of good and let them be re-used as if they were new! Set up Everything you plan to take to the show. Set up all the modules, even if you have to line them up on the floor of the garage! Plug in power- make the track live and run a train! Plug in auxiliary power- make the lights blink and the whistles blow! If you have a train cam, make it work! Set up the DCC and test the throttles. Replace the batteries in any wireless equipment. Now that you have everything you plan to take set up and working, NOTHING goes back in the train room; NOTHING gets taken upstairs to work on it! Pack everything into its boxes and load the boxes directly into your vehicle. Do not pass GO. Do not collect $200. By setting up everything and making it work you reduce the chances of leaving that important widget behind! So you've loaded up the stuff and hauled it to "The Scene of the Crime." And it's now a large pile of plunder at the center of your layout space. What do you do now? Well, first of all, you should NOT dump all your stuff at the center of your layout space! 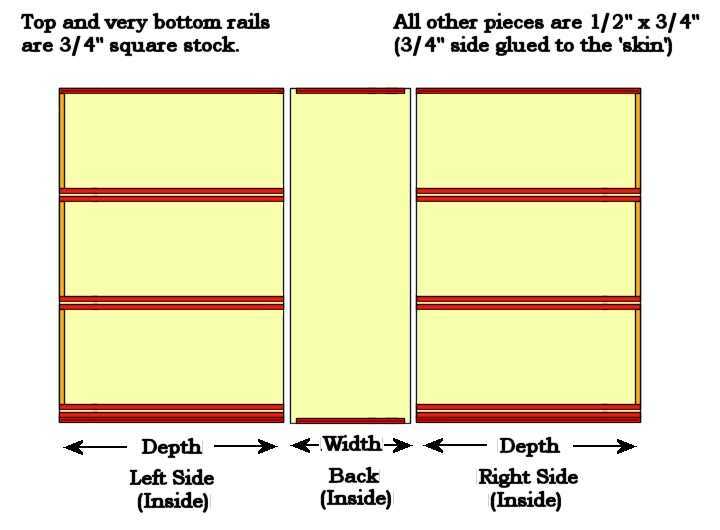 You need to line up your tables in accordance with your layout plan. And all that 'stuff' is now in the way! Here's a suggested "Order of Setup" for a show exhibit. Mark your space boundaries, if the show organizers haven't already done so. Mark the table locations. This could involve chalk lines for a large layout; a smaller layout can rely on 'eyeballing' straight lines. Remove the staples from the table tops. Many tables have poking and protruding staples from previous events. These can snag on table covers, and make bumps where you least expect them! A couple of pairs of needle-nosed pliers and some idle bystanders will take care of the problem. If you have any large or tall signs that straddle tables, set them up now. Line up your tables in accordance with your layout plan. Try to arrange the tables so there are as few peaks and valleys as possible. This may require shims under the table legs. Effort to level the table tops will reduce 'tweaking' of individual module leveling bolts. "Flat" is more important than "level." Drape the table covers! -BEFORE- you place any modules!! Table covers on side branches must NOT extend over tables on the spine! You will (probably) have to shift the side branches to line up with your junction modules once the spine is complete. If the table covers are involved, moving the side branches becomes a much-more complicated process! -- Keep (and use) a trash bag or waste basket! Never Sit, read, smoke, eat, or drink in the booth. Try to keep your 'banquet' unobtrusive! Hide the empty wrappers, cups, etc. Stand up. Or use a tall stool. You want your head at the same level as the folks you're chatting with! Never Ignore prospects by forming a cozy cluster and chatting with colleagues. Don't shmooze with your buddies. You'll see them at next month's meeting. Talk to the new folks. Never Use the (booth) telephone while visitors are around. Never Leave the booth unattended or leave without informing colleagues. Never Be late for booth duty. Never Close off conversation by crossing your arms. Never Stand with your back to the aisle. Never Say "Can I help you." Never Lean on booth furniture. Never Drink alcohol or eat garlicky or spicy foods during the day. Never Use inappropriate language, complain about the show or about being at the show. Never Wear new shoes or high heels. Never Let the booth get cluttered, untidy, and unorganized. And here are some things you "Must Do:"
Do Prepare 3-6 engaging questions before the show. Do Create the right first impression. Do Encourage visitors to want to spend time with you. Do Be friendly and non-threatening. Do Ask questions that stimulate thought and encourage conversation. Do Ask open-ended questions - beginning with who, what, where, when, why or how. Do Relate questions to the industry, product/service and its benefits, or to a specific situation. Do Avoid trite questions, such as: "Can I help you? "; "How are you doing today? "; Are you enjoying the show?" Examples of Engaging Questions: Industry-related... Sample question: "What concerns does your organization have regarding (issue)" Product/service-related... Sample question: "How could you see using (product/service) in your organization?" Benefit-related... Sample question: "How important is (benefit) in your present situation?" Situation-related... Sample question: "What are your most important needs in (situation)" Sample question: How familiar are you with our product/service/company?" The scenery that really needs a good dusting! Perform 'triage' on the Pile of Plunder you took to this show. Separate the items you didn't use or can do without into the 'never take again' pile.